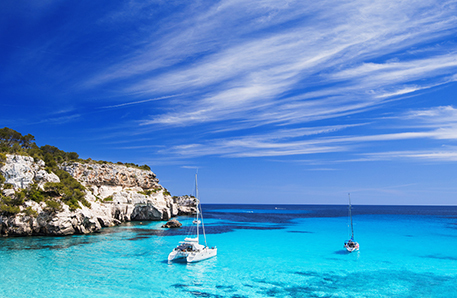 The island of Menorca is incredibly popular with families with younger children, with activities in almost every resort! There are 3 waterparks on the island, 2 on the West coast and 1 on the East, a number of splash pools and waterslides, childrens play areas with trampolines and bouncy castles, go-karting tracks, horseriding centres and mini golf facilities to name a few! Whicever resort you choose to stay in, there's sure to be something within a short walk or drive for a fantastic family day out. Aqua Center Waterpark There are 3 water parks on the island, 2 on the West coast and one on the East coast of the island. Aqua Center Waterpark in Calan Forcat is the largest of the islands 3 waterparks. There is a go-kart track as well as a swimming pool and waterslides, and a games arcade with a covered eating area. Go-Karts There are several go-kart tracks on the island offering different courses and facilities to suit all ages and levels. Castillo Menorca, on the road from Ferreries to Cuitadella, also has a great go-karting track as well as an adult and childrens pool, waterslide, trampolines, childrens play area, shopping complex and restaurant. Or try the go-kart track at Aquarock Waterpark. Mini Golf A firm favourite with the kids, there are several, well kept courses around the island. Castillo Menorca, just outside of Ciutadella, has a great mini golf course as well as various pools, shops, childrens entertainment and a restaurant. All the courses have a cafe or restaurant adjacent where parents can relax and keep a watchful eye. The resorts of Santo Tomas, Cala Blanca and Cala Galdana all have mini golf facilities as well as Goody Goody Park in Calan Bosch. Pony/donkey trekking All the riding schools have facilities for children and the equestrian shows attract locals and visitors alike from all over the island. A particularly popular horse riding centre is Menorca Horse Riding in Mahon where children can have riding lessons or go trekking through woods or along the beaches. The centre caters for all ages, from beginners to experts. Bouncy Castles Some of the resorts on the island have bouncy castles and trampolines which are very popular with younger children. Aqua Centre and Park Aire in Calan Forcat all have bouncy castles and inflatables while the Coves Noves Complex in Arenal Den Castell has a inflatables, bouncy slides, mini golf and go-karting! Aqua Rock Waterpark Aquarock Park by Calan Bosch Marina is a great place for older children offering a go-kart track, trampolines and a large swimming pool with waterslides. Splash Waterpark Splash Waterpark is the newest of the islands 3 parks and can be found in Biniancolla, halfway between Binibeca and Punta Prima on the East coast of the island. Castillo Menorca Castillo Menorca, located on the main road between Ferreries and Cuitadella, has an adults pool with a water slide and a childrens pool, as well as mini golf, trampolines, a childrens play area, a shopping complex selling leather goods, jewellery, ceramics and gifts, a snack bar and a fantastic go-karting track! WiFi is also available. In addition to the above, several resorts also have water slides or splash pools, the largest being in Son Bou. Smaller slides for younger children can be found in Cala Galdana and Cala Blanca.